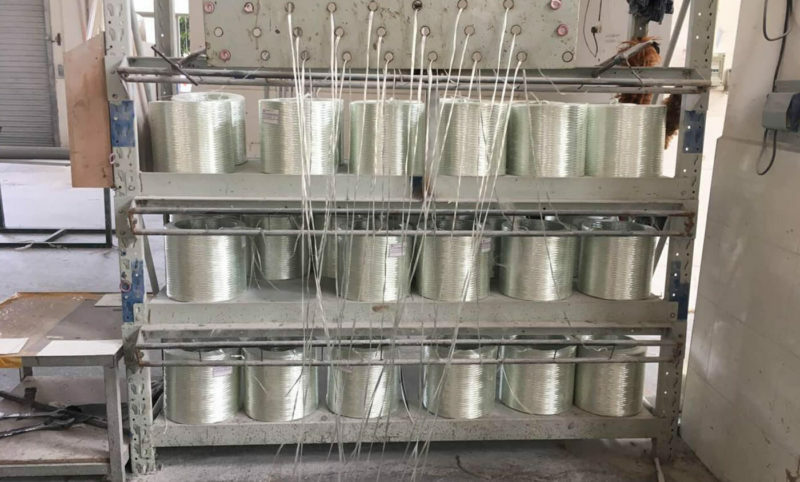 We always use resin impregnated fiber or fiber glass, aromatic polyamide fiber or carbon fiber wrapped in the axis of rotation of the desired pattern for filament winding. 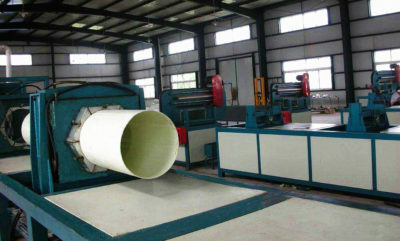 Generally, this method makes the fiberglass product without void possible and makes high fiber volume ratio up to 80%. In wet method, the fiber extracts low viscosity resins through the tank or from the metering application system. 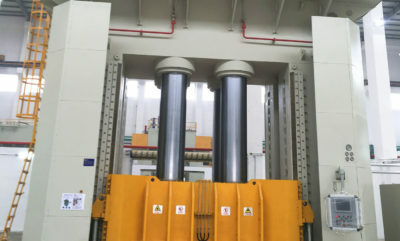 In dry method, the reinforcement is in preimpregnated form. After we wind the layer, the components of fiberglass are solidified. Then we remove it from the spindle. Generally, we use this method to produce pressure FRP vessels, rocket motors, FRP tanks, FRP duct, golf clubs, fishing rods, and pre-leaching. Thermosetting resins we use in wire winding parts include polyester, vinyl ester, epoxy resin and phenolic resin. Certainly, we can make this approach automatic and it can provide high productivity. Due to the fiber placement control, we can reach the highest strength of FRP products . Also, intensity control in different directions is also possible. In the frp manufacturing process of wet winding, place the liquid matrix in a resin bath and soak the fiber in the bath and wrap it around. The matrix will be liquid form. A solid like thermoplastics can also be melted into liquid form. In this fibre reinforced plastic manufacturing process, the fibers are first wound and without stroma. After winding, the matrix is permeated through pressure injection molding or vacuum impregnation. This impregnation viscosity must be very low. The fibers were first wound and deposited by chemical vapor deposition (CVD) or physical vapor deposition (PVD). In this method, the matrix frp material is in powder form. It is injected into the fiber during winding, and then converted into solid by sintering or melting. Preleaching is a previously impregnated fiber, adhesive tape or clothing. Presoak will maintain the correct proportion of fiber and resin. The preimpregnated material is semi-solid, the winding is more convenient. And the winding is converted to solid by heating or sintering. In this method, woven fabrics are made from woven fiber and resin in the form of fiber. The binding enhancement and matrix filaments are treated as warp and weft fibers and are woven. In the mixed type, each bundle of filaments will have a matrix and enhanced fiber. After winding, the material is heated to melt the matrix filaments. Wrap the fibers around and spray the substrate through the plasma spraying. We convert the matrix to solid. Generally, we roughly divide the conversion process into two processes. In the FRP process of reaction, we make the matrix by chemical reaction of materials. It can be the polymerization process in reaction injection molding (RIM) or crosslinking. In the case of carbon – carbon FRP composite material, the permeation of phenol are converted into graphite by polymer pyrolysis. In this FRP process, the monomer of the polymer permeates the filament. The reaction continues to convert monomers into polymers. We can make thermosetting resins such as epoxy resin, polyester, phenolic resin into liquid form. Then, using resin of cross-linked additives for winding in the filament winding process to continue operation. After winding, we help to convert the linear polymer liquid into crosslinked solid materials. We firstly make preimpregnated materials by coating the fibers with thermoplastics. Then, we use presoak FRP material for winding. And after the winding, it will fuse into a solid. 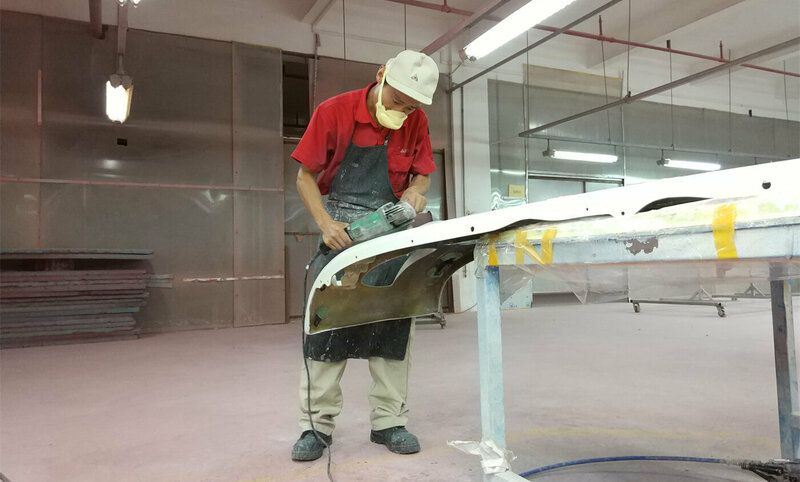 Presoak thermoplastics melt and material can pass solution impregnation, melt impregnation, film or powder coating, and so on. In this process, the matrix is powdery. Before winding and in the process of winding, we pre-coate the fibers with powder. Next, we incorporate the powder into the fiber through penetration or powder injection. Then heating it to form a solid material. This method is suitable for PTFE, which requires very high temperature melting. We can penetrate the steam from metals, ceramics, and carbon into the fibers, and cool then to form the matrix. There are four advantages of filament winding. Firstly, fiber winding is semi-automatic. And we can complete it in a more orderly manner with fewer workers. Secondly, in the case of fiberglass, filament winding can make fiber content as high as 70%. Thirdly, we always use this process to make large tanks with a diameter of 15 or 16 meters by using special winding mechanisms. Fourthly, by changing the angle of the winding, it can change the intensity of the product in different directions. Also, there are four limitations of it. 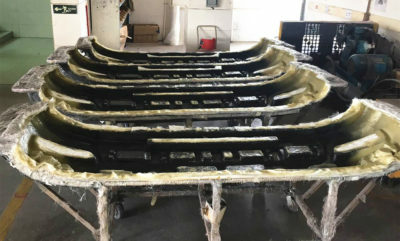 Firstly, we can not wind fiberglass reinforced plastic products with complex GRP profiles and curvature reversal. Secondly, there is low shear strength between layers of products. Thirdly, the ultimate bearing capacity is low and they are stiff but not so resilient. Fourthly, the laminate quality of filament winding products is usually lower than that made of high pressure sterilization.